Boron (B) deficiency is one of the major abiotic stresses to citrus. Trifoliate orange, as the most important citrus rootstock in China, is sensitive to B deficiency. B deficiency has serious negative effects on metabolic processes in roots, but whether the hazardous effects can be alleviated to some degree with B resupply remains unclear. The purpose of this study was to investigate the effects of B resupply on metabolites and metabolic pathway in B-starved trifoliate orange [Poncirus trifoliate (L.) Raf.] roots. Gas chromatography-mass spectrometry (GC-MS) was used to analyze the metabolic profiles in roots under different treatments of B deprivation and B resupply. B deficiency induced an obvious enlargement of root tips and significant alterations in metabolites. Changes were also observed in basic or neutral amino acids, several organic acids and carbohydrates of B-starved roots. However, one week of B resupply quickly reversed the changes in the roots with the initiation of new roots across the inflated root tips, and the restored some of metabolites to a normal level, such as proline (Pro), linoleic acid, 6-deoxy-D-glucose and myo-inositol, indicating that these metabolites are very sensitive to B availability. The data suggest that B resupply may contribute to the obvious, although not full, recovery of the root growth by reversing the central metabolite changes. 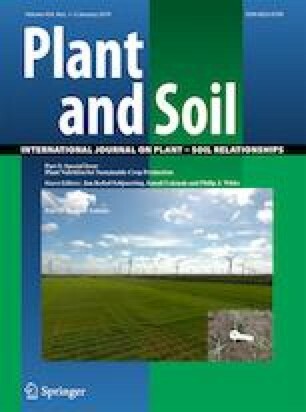 This study provides a new insight into the relationship between root growth and the alteration on metabolites induced by B deficiency and B resupply, which can be expected to make an important contribution to the scientific application of B fertilizer. Responsible Editor: Jan Kofod Schjoerring. The online version of this article ( https://doi.org/10.1007/s11104-018-3684-8) contains supplementary material, which is available to authorized users. This work was supported by the National Natural Science Foundation of China (41271320) and the Fundamental Research Funds for the Central Universities (2017PY055). We would like to thank C.C.J. for supervising this study, G.D.L for interpreting the results of the study, L.Y. for renewing the nutrition solution in the experiment and determining the B concentration, M. R. for revising the manuscript in grammar.